← Concord Monitor Believes Govt is Entitled To Our Money? So most of the dumb and ignorant are freaking out because Net Neutrality was demolished by FCC Chairman Ajit Pai. I say these people are dumb because most of them, if not all, totally think Trump is among the worst sorts of people. You know, like a fascist, tyrant, dictator, etc. Net Neutrality was (hee hee was!) a government regulation governing Internet services. The same government currently run by said fascist, tyrant, dictator. Doesn’t it make sense that if you really think Trump fit those characterizations that you wouldn’t want him in charge of regulating Internet services (on which so much information flow) where he can make all sorts of fascisty, tyranty mischief? Seems, odd if you do. So either, those people really don’t think Trump is one of those things, or they don’t understand what Net Neutrality is. Which is it? Are they liars or just incandescently ignorant and want to remain so and prefer to tantrum instead? 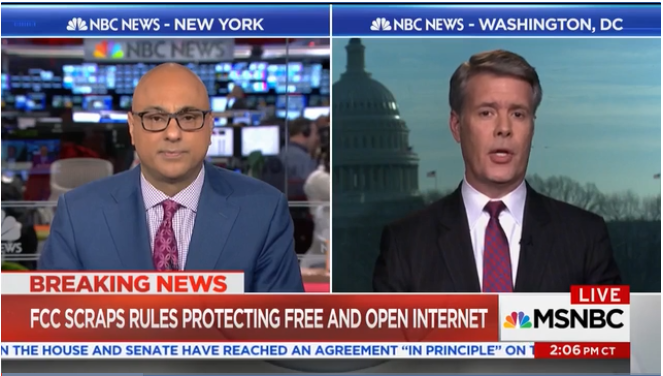 Check out this MSNBC host getting it hard from someone who knows what he’s talking about regarding Net Neutrality, a former FCC commissioner. The host starts getting angry because he knows he’s getting destroyed by facts that run contrary to his dogma and that darn #$^! Trump! An appeal to you people freaking out: Please click on the link and watch the video. If not for me, for yourself. The world will not end because Net Neutrality is no more. Just breathe… in… out.. relax. This entry was posted in National News and tagged FCC, MSNBC, Net Neutrality. Bookmark the permalink.